With a huge 170 pages of editorial in a 186 page PDF publication, ABM's Sportfishing is Editor/author Peter Webster's first big annual-type book we have ever produced, actually designed for reading on a computer or tablet, with special typography, stunning pictures, and simple, easy to read layout. It is a publication created to be a real inspiration and working guide to newcomers to sport fishing, and at the same time, a wonderful walk down memory lane for the older hands. Marvellous 'back verandah' reading material includes historically significant features about sport fishing pioneer Athel D'Ombrain, the 'Big Man' of game fishing, Peter Goadby, and indomitable boat builder, David Pleysier. 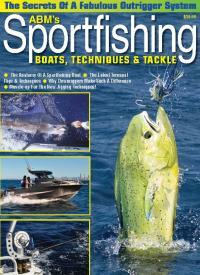 Description: Awesome 186 page PDF book on sport fishing around the Australian coast.